A couple of months back, we were reading about various pastoral tribes of India as part of social sciences curriculum of ninth standard. While locating them on the map, somehow the heterogeneity, diversity and vibrancy of our homeland had me enraptured yet again. The text in the book could not appease my curiosity so we read and researched some more, in fact a lot more and checked their unique nomadic lifestyles, their labour intensive art forms and much more. The common thread that became very apparent after having read about different tribes is how closely blended they are with nature, how respectful they are to the invaluable gift that is being laundered mindlessly by the 'developed societies', how so caringly they co-exist with their ecosystem and how they manage their annual routines in rhythm with changing guards in nature. It is interesting to read about Meghwals of Mewar, Rajasthan who migrated to Sindh in Pakistan in the 17th century, and then on to Kutch in 1971 after the Indo -Pak war. They forged a partnership with nomadic pastoralists Maldharis of Kachch. When a Maldhari cattle dies, adept hands of Meghwals convert the raw hide into a piece of utility or of art in leather. Meghwals also brought with them their exquisite embroidery styles and stitches, which still bear some resemblance to the embroidery done in Afghanistan. So what we see as a Meghwali (a form of Kachchi) embroidery is actually a beautiful amalgamation of northern and eastern styles of magic with needle. Monpas, the only nomadic tribe in Northeast of India are known for their wood carving, carpet making and weaving. They are completely dependent on animals like sheep, cow, yak, goats and horses and usually do not have any permanent settlement or attachment to a particular place. The 6th Dalai Lama was a Monpa by ethnicity. Banjaras, Kurubas, Kurumas, Gaddis and Gollas are some other pastoral tribes with riveting past and present. 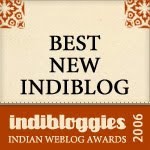 Even divinity helps a seeker in many strange ways, and I actually experienced it once again when I was sent the book 'Saffron Picking, Khadi-Weaving' to review on ST. Oh, what a treat it was for me, especially at the time when my mind was almost invariably wandering with the nomads of different regions. This little book is a befitting tribute to eight communities across India. The journey begins from a household of saffron-growers in Pampore region of Kashmir. All members of the family pitch in at every stage of the lifecycle of these bright-hued strands to roll out the world famous condiment. The next stop is Rann of Kutch where Agariyas, the migrant salt makers work untiringly for two quarters of a year under extremely trying circumstances. From the white expanse of salt desert, the readers are led again to colourful world of Moosahar tribe, engaged in Sikki basket making. From cutting of the sikki grass, drying it, dyeing it into myriad colours to weaving and coiling the grass - every step demands loving hands, committed heart and patient mind. Leaving a grandma passing on her sikki handling skills to her grandson, the narrative takes us towards the Eastern Ghats, somewhere in Odisha, where we meet a group of women setting off to collect Sal leaves for plate making. They dedicate the following day to drying them, stitching them and pressing them to make them ready for the market. By this time, I had my laptop open along with the book and as I read about each community, I sifted the net for more images and more details. 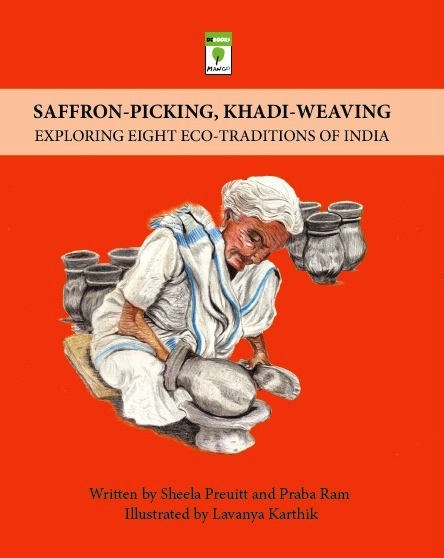 Furthr, the following pages open a small window into the worlds of Kumars and Hiras (traditional potters) of Assam, Changpa (pashmina wool traders) of Ladakh, indigo growers of Bagru-Rajasthan and khadi-weavers of Ponduru, Andhra Pradesh. Lavanya's illustrations perfectly accentuate the earthiness of the narrative. Her strokes and choice of colours add depths to the stories picked up from different regions of the country. Lavanya, wrinkles on the face of that pot-making grandma just had me captivated for quite some time. Her lines of age speak volumes about her experience, her commitment and her contentment. Praba and Sheela, reading and reviewing your book was a delight and I must compliment you on your beautiful tribute to these everyday-heroes who work silently in tandem with nature, fighting all odds to keep their skills and crafts alive. I so wish that books like these become a part of school curriculum so that children learn to appreciate eco-friendly coexistence and if possible visits to these places should also be organised by the schools. Will look forward to more coming from your pen!!! I can't wait to read this book. The topic fascinates me and I have been eagerly waiting to get hold of it...but I am unable to find it online. Any places in Blore, where it is available ? It was a great experience for us to research and write about them as fictional tales. Thanks to our wonderful editor at Mango who is always been open to fresh ideas, giving us ample time to explore and enjoy the writing.